For the first time, there's a state-by-state scorecard of America's performance in providing long-term services and support to senior citizens and people with disabilities, and the results overall aren't much to brag about. AARP's Public Policy Institute, The Commonwealth Fund and The SCAN Foundation jointly released the report: A State Scorecard on Long-Term Services and Supports for Older Adults, People with Physical Disabilities, and Family Caregivers. The study measured four areas: affordability and access; choice of setting and provider; quality of life and quality of care; and support for family caregivers. 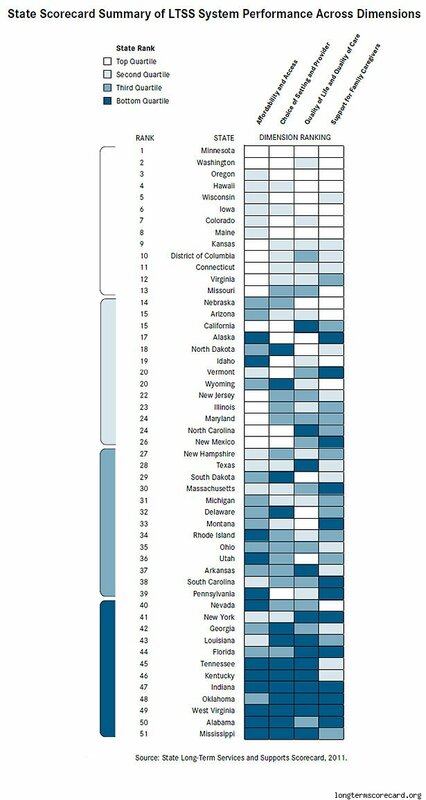 It assesses each state's performance as a whole and on 25 individual indicators. LTSS -- also called long-term care services -- includes a host of services and supports for people who need help with routines such as bathing, eating, for example, because of a physical, cognitive or chronic health condition that isn't going away any time soon. LTSS is mainly about one person helping another with these activities, but also includes access to gear like wheelchairs and modifications like ramps. What fits the bill of a "high-performing LTSS system"? According to the report, for starters, people should be able to easily find and afford the services they need. They should also be able to have some control over where they receive services and who provides them. Services should maximize positive outcomes and people should be treated with respect. Personal preferences should be honored when possible. The needs of family caregivers are assessed and addressed so that they can keep helping without being overburdened. Care should be organized, coordinated or integrated with health-related services, as well as with social supports. Based on those standards, Minnesota, Washington, Oregon, Hawaii, and Wisconsin were the top performers. The five bottom dwellers: Indiana, Oklahoma, West Virginia, Alabama and Mississippi. The study acknowledges that some aspects of a high performing LTSS system could not be assessed because adequate data, consistent across all states are not available. For example, quality of care measures are only available for nursing homes services and home health, not for community-based home and community services. Despite the limitations, it is at least a healthy starting point to draw a picture of America's LTSS system. "This Scorecard is a critical first step toward creating a much more person- and family-centered system of care that delivers services honoring each individual's dignity and choices," said Bruce Chernof, president and CEO of The SCAN Foundation, in a prepared statement. "To fully realize the vision of a high-performing long-term services and supports system, we must measure performance, track improvements and create opportunities for states to learn from each other." According to the study, there's a strong correlation between broader economic factors and state performance, though there are exceptions. Many of the laggards in LTSS are also the states with the lowest median incomes and highest rates of poverty. Another variable is Medicaid. It is the primary source of public funding for LTSS, and determines what types of LTSS are available to those with low and modest incomes. Given the wide latitude state have in setting rules for which of their residents qualify for various services, which services they will cover, and what they will pay, state policies are a key factor. 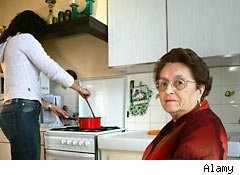 The study found that generally, states with the highest level of performance have public policies that "Improve access to services and choices in their delivery by directing state Medicaid programs to serve more people in need and offer alternatives to nursing homes that most consumers prefer. Establish a single point of system entry to help people find needed information and more easily access services. Improve support for family caregivers by offering legal protections as well as other services to address caregiver needs." The report is explicit: "All states need to vastly improve in areas including home care, assisted living, nursing home care, and supports for family caregivers, and more efficiently spend the substantial funds they currently allocate to LTSS." 667,171 more individuals with disabilities would be covered by Medicaid if all states could achieve the rate of the top-performing state on this indicator. There would be 201,531 fewer costly and unnecessary nursing home admissions if all states could do as well as the state with the lowest rate of unnecessary nursing home admissions. There would be 120,602 fewer avoidable hospitalizations -- at a savings of $1.3 billion nationally -- if all states could achieve the rate of avoidable hospitalizations of the state that performs best on this indicator. "This report will help states make and sustain targeted improvements so that people can live and age with dignity in their own homes and communities," said Susan Reinhard, senior vice president for public policy at AARP, in a prepared statement. "Achieving a high-performing long-term supports and services system will require a concerted effort from both the public and private sectors."